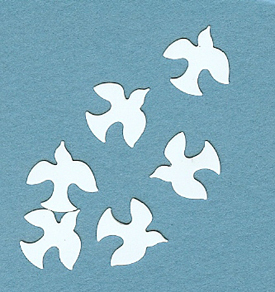 Elegant white doves for the wedding, bridal shower, or to represent the dove of peace. Tiny 1/2 inch dove confetti. Bag contains 1/2 oz. If used to sprinkle around centerpieces, one bag does 2 1/2 tables. Please note that the blue is just background. The confetti is all white. Regular price $2.00 per bag. 11 bags available.